The D II appeared later than the D I but was derived from the earlier M.17z prototype. The D II had shorter wings and a longer fuselage, and as it was powered by a 75-kW (100-hp) Oberursel U.l rotary engine it was lighter and more manoeuvrable than the D I.
M.17E, a version of the M.16E with a 100 h.p. Oberursel rotary engine instead of the liquid-cooled Mercedes of the latter. Equipped with one machine gun, the M.17E was not put into production. 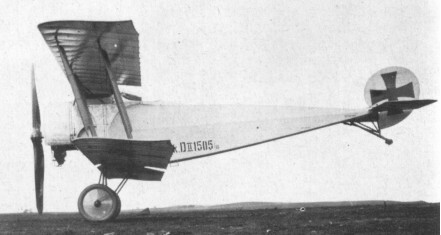 The D.II (M.17ZF) fighter, designed by Martin Kreutzer, appeared early 1916 and was completed before the D.I. With a 100 h.p. Oberursel engine it attained a speed of 150 kph, and the armament comprised one machine gun. A total of 77 of this type were produced.